Photodynamic therapy in New York City (PDT NYC) is a treatment that can be recommended by Manhattan dermatologists for precancerous skin growths, cancer cells, and sometimes even acne. 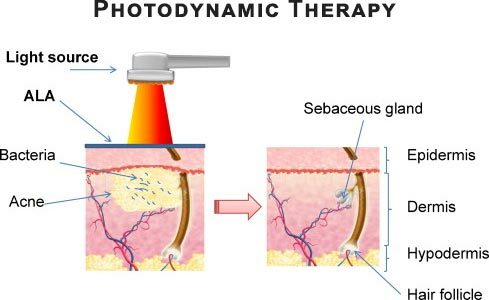 Photodynamic therapy is also sometimes called photo radiation therapy, phototherapy and photochemotherapy. PDT NYC is a two-step procedure that uses a type of medication called a photosensitizer in combination with a light that can combat cancer or precancerous cell growth. The drugs can be applied topically, taken orally or given intravenously. The medication, however you get it, is activated by the light. 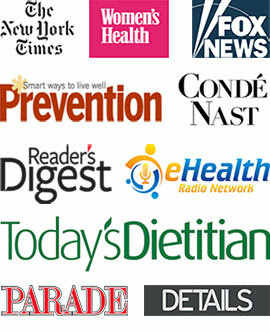 PDT NYC stops cell growth and even kills cancerous cells. The process doesn’t injure your normal, healthy cells because they’re able to process the photosensitive drug and so aren’t damaged at all during the procedure. Because photodynamic therapy is a minor procedure, it requires only numbing cream and no anesthesia. Therefore, the PDT NYC procedure can be done in your New York dermatologist’s office. Before you arrive for your appointment, you should know what to expect. Fortunately, there isn’t much that you need to do to prepare for your treatments. Keep the target area clean of all body products, including makeup and lotions. You don’t want anything to get in the way of a successful photodynamic therapy treatment. If you are going to take the photosensitive drug intravenously — which is the most common method — your NYC dermatologist first applies a numbing cream to the treatment area. Next, the doctor gives you the photosensitizing agent. Commonly, this is done through an IV, and the drug is absorbed through your bloodstream by both cancerous cells and non-cancerous cells. After you’ve been given the IV, you have to wait for a bit to allow the cancer cells to absorb the drug. Your normal healthy cells process the drug and get rid of most of it, while higher concentrations of the drug remain in your cancerous cells. Waiting for the drug to fully be absorbed and processed takes about two to three days, so you need to return to your dermatologist in New York City for the second part of the treatment. For the second part of your treatment, your dermatologist in Manhattan directs a laser at the area of your body to be treated. 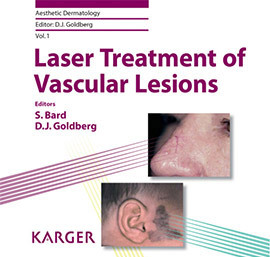 The laser is a very low-powered light, and you won’t feel any pain during this process. You may feel a warming sensation, but the laser can’t burn you. The entire process takes about 30 minutes to an hour to complete, depending on the size of the treatment area. Finally, if your New York dermatologist believes that you need to have dead tissue removed, you have to return for a follow-up appointment after another four to five days. At this follow-up appointment, your dermatologist can determine if any additional treatments are needed. It isn’t uncommon to have multiple photodynamic therapy sessions, so you shouldn’t be alarmed or surprised by this news. These are all great for keeping your skin safe. Also, try to arrange your schedule so you can complete errands and travel during the evening hours to minimize exposure to the sun. These steps should be followed for at least a month after your procedure as a precaution. You should see the results of this procedure almost immediately. Results continue to improve over the following couple of weeks. PDT NYC is more commonly used to treat cancerous cells and not necessarily for cosmetic purposes, so discuss your expectations for improvement at length with your dermatologist in New York. Some studies suggest PDT NYC works as well as surgery or radiation therapy with less recovery time and fewer complications. There are no long-term side effects from PDT NYC. It’s a relatively fast procedure and can be done in-office. There is little to no scarring. It’s more affordable than many other cancer treatments. It can only get cells where the light can reach. The therapy can’t reach very deep into the body and therefore is limited to cells on the surface or just under the top layer of skin. It can’t be used on cancer or precancerous cell growth that has spread to many places on your body. You’ll be sensitive to light and the sun after your treatment due to the nature of the photosensitive drug used. So you have to avoid light, which can hamper your lifestyle. You probably have to take some time off work and make some minor at-home arrangements. This treatment cannot be performed if you have some other medical conditions — typically, those affecting your blood. One of the major benefits of this treatment is that there are few risks or side effects. There may be some swelling at the treatment site, however. If this happens to be near your throat, it could cause difficulty breathing. A rare side effect possible is having an allergic reaction to the photosensitizing agents used. This is one of the reasons why your dermatologist in Manhattan has to conduct this procedure. If you have any unusual feelings during or after the procedure, report them to your doctor. Also, be sure to keep your home dark while your body is absorbing the light-sensitive material. Your sensitivity to light is unique to you — and in rare cases, it could last as long as three months. Your dermatologist can help you determine what you’ll need to do to protect yourself. Rely on your top dermatologist in Midtown Manhattan to view all the necessary precautions to prepare you for your photodynamic treatments. Do you have any questions about Photodynamic Therapy? Would you like to schedule an appointment with an internationally recognized, top dermatologist in Midtown Manhattan, Dr. Susan Bard of Manhattan Dermatology Specialists? Please contact our Midtown or Upper East Side NYC clinic for consultation with cosmetic and laser dermatologist.